A favorite classroom prep tool of successful students that is often recommended by professors, the Examples & Explanations (E&E) series provides an alternative perspective to help you understand your casebook and in-class lectures. Each E&E offers hypothetical questions complemented by detailed explanations that allow you to test your knowledge of the topics in your courses and compare your own analysis. Clear explanations of each class topic, in a conversational, funny style. Features hypotheticals similar to those presented in class, with corresponding analysis so you can use them during the semester to test your understanding, and again at exam time to help you review. It offers coverage that works with ALL the major casebooks, and suits any class on a given topic. 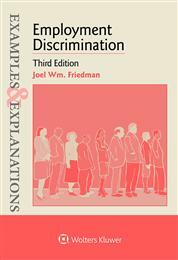 The Examples & Explanations series has been ranked the most popular study aid among law students because it is equally as helpful from the first day of class through the final exam.